My 3 Monsters: Nikon D3100 Giveaway!!! I'm working on a couple new projects today. I hate being in the middle of projects, with nothing pretty to show yet. Just a big ol' mess in my house because I really need more than just a craft closet to contain my crafting obsession. Someday I'm going to buy the house next door and make it my crafting/guest house, but that is neither here nor there today. I may not have anything of mine to show you, but here is something really cool! Do you know Groop Dealz? They offer daily boutique deals, delivered to your email in box. I've bought some of my favorite jewelry and accessories there for a fraction of the retail price. They also sell really stylish home decor, party goods and childrens goods. It's something new every day!! I love getting my Groop Dealz emails. 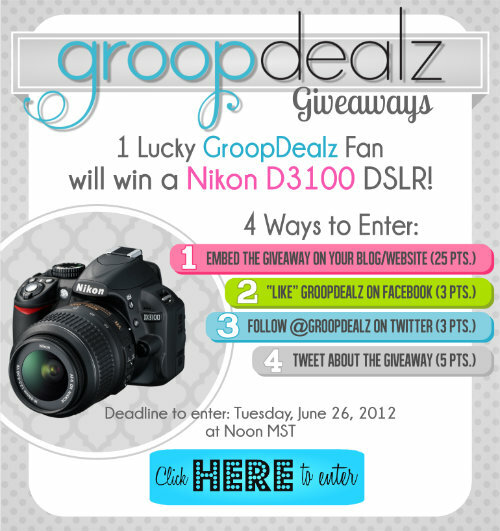 Check out Groop Dealz here and click on the image above to enter the camera giveaway! !